Eile oma esimese istungi pidanud uus riigikogu koosseis kogunes ka ühispildile. 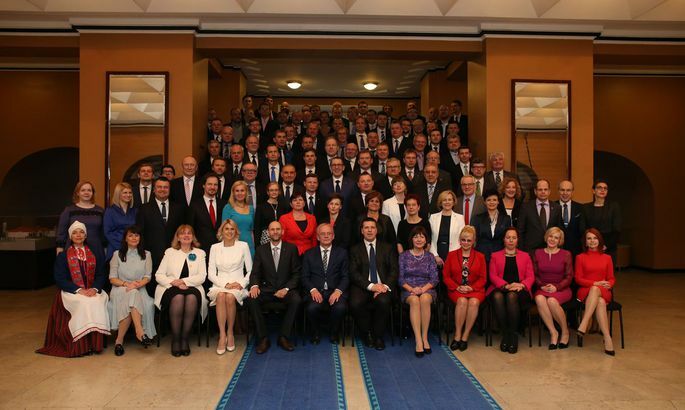 Parlamendi lõplik koosseis selgub aga alles siis, kui on teada, kellest saavad ministrid. Imagine the feeling of putting together a government and handing out portfolios with every party pondering a makeover in a year, latest. Tomorrow, Reform the chief talker will get its initial real life chance to have something agreed. For a moment, Good Friday cools their heads. Come Resurrection Sunday, the three may convene their councils and flash green lights to «hesitation union» to emerge. Should minister jobs remain for Reform, Soc Dems and IRL heads to distribute (and, officially, portfolios have not been name-tagged), the formation is as follows: Reform gets seven, the others 4+1 positions. Explaining: the junior partners are handed four minister seats plus president of the Riigikogu Eiki Nestor and vice-president Helir-Valdor Seeder as elected yesterday. At Toompea, the votes held steady equalling a step closer to the government. More interesting than ministries are the personas weighed by parties to sit on the key chairs. Among reformers-squirrels, on top of the prime minister Taavi Rõivas, governmental future looks bright for Jürgen Ligi, Keit Pentus-Rosimannus, Hanno Pevkur, Urmas Kruuse, Kristen Michal, and Arto Aas. We did hear the talk of MEP Urmas Paet perhaps emerging as future EU Minister. Now, not many believe he is returning... neither is he too heartily expected to. By his excellent votes tally in Pärnu, Toomas Kivimägi might make it to government citing former Reform logic, but the man has expressed desire to first learn about life in parliament. The same has been said by Generals in Reform Party, Ants Laaneots and Johannes Kert. In the inwardly torn IRL, Juhan Parts as well as Ken-Marti Vaher will at the moment rather take back seats. The new rising stars are Kaia Iva, Jaak Aaviksoo, Marko Mihkelson, and Helir-Valdor Seeder. And, naturally, the party chairman Urmas Reinsalu soon to face vote of confidence as such. Also, Sven Sester and Liisa Pakosta are being named as potential ministers. In Soc Dems ranks, chairman Sven Mikser has battles raging in multiple fronts: would be nice to stay in power and remain a dignified party chairman. Other minister-material next to Mr Mikser (eyeing the foreign minister seat) are Andres Anvelt, Indrek Saar, the not-in-Riigikogu yet esteemed finance expert Rannar Vassiljev, Helmen Kütt and Urve Palo. An agreement as painfully reached as this one, no-one remembers. Under various pretexts, the talks have dragged on for a month. Why? Versions abound. Definitely, one is attempt to prove that Taavi Rõivas is a failure at negotiations. Even so, Mr Rõivas is cool at the helm – as even praised by the Free who exited the talks – and is not moved by political tricks. Convening yesterday, board of Centre elected Kadri Simson as official replacement for the hospitalised Edgar Savisaar. Soc Dems may not have buried a dream of reigning together with them. For the political ploy, however, they’d need IRL support. For the latter, a coalition with Centre would be risky indeed. For IRL, in every issue they would stand alone against two left wingers and such as court the Russian speaking voter. Once upon a time, Res Publica tried a coalition with Centre in Tallinn – resulting with the party ceasing to exist as independent unit in Estonian politics. Playing with Centre, however, would free Reform hands to follow suit – though perhaps prematurely and too forcefully excluded by Mr Rõivas. But ... it is easier to make a government with three than with four. And, again, it is easier for two than for three. Meanwhile, considering the elections results, IRL should not feel bad at all. Last week, they won a vital victory with administrative and state reform agreement. «That did not come easy – the party might as well go ahead and decorate Mr Reinsalu, Mr Seeder, Ms Iva and Mr Aaviksoo for the good fight,» think the other negotiators. Also, IRL has been able to defend income tax exemption and parental pension. After the festive Riigikogu day yesterday, the talks continued today. Actually, there is not much left to discuss and, possibly, they will «do business» tomorrow. All they need to do is delete some non-priorities without reach, and nod the conclusive agreement to main issues.